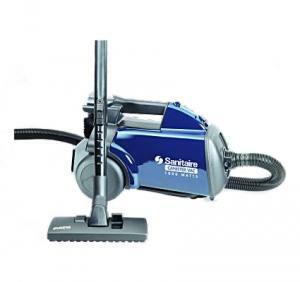 If your cleaning needs include bare floors, low pile carpeting and high spaces, the Sanitaire model S3681 could be a great fit. It is powerful, with a 1400-watt commercial motor, and yet it's compact and lightweight, easy to carry and easy to store. It comes with deluxe tools for a wide variety of cleaning jobs and an extended reach wand to help you clean hard-to-reach areas. This Sanitaire is tried and true...and will serve you as a long lasting cleaning tool. Box Dimensions: 11.25" x 19.00" x 15.75"
Pleasently surprised with the product. After one use I was sold.! Phone help was very good. Very positive transaction. Thank you. I am extremely pleased with the versatility of the vacuum. It easily goes from tile to carpet and the amount of suction is great! I will definitely purchase from your company in the future. Fast, efficient. Saved $50 from price aty local dealer. Will use you again. We had owned a Mighty Mite vacuum for years and it worked great until I used it on drywall dust. Wife wanted another so we went to 6 stores in the area with no results so I used the internet. Yours was the best website that seemed to be the most trustworthy so we bought. No regrets. Thanks for your efforts we will recommend to friends and relatives. What a great vac and what a great price....and the spped of delivery also was quick..I'll be back!